Tip: You can make this yourself with an empty Veggie cap and two drops of DigestzenÂ® essential oil. You can feel it when your immune system isnâ€™t functioning at its best. The doTERRA On Guard+ Softgels can give your immune system a boost during those times by protecting against environmental threats. * It also can help maintain your bodyâ€™s healthy circulation. 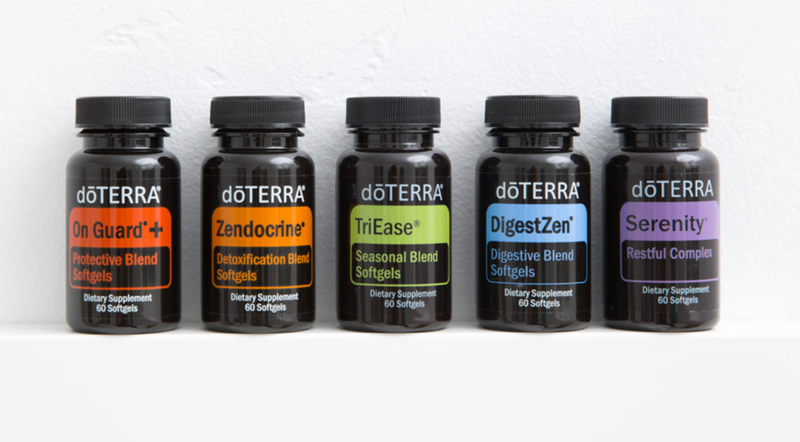 * The doTERRA On Guard blend in the softgels contains Wild Orange, Clove, Black Pepper, Cinnamon Bark, Eucalyptus, Oregano, Rosemary, and Melissa. Perfect when youâ€™re about to step into the great outdoors, TriEase is mainly about helping your body deal with seasonal threats by supporting the respiratory system and clear breathing. * It is made up of the well-known blend of Lavender, Lemon, and Peppermint. Need to detox? Zendocrine Softgels can help your bodyâ€™s natural ability to cleanse itself to clear your body of harmful free radicals and toxins. * As part of this cleansing process, Zendocrine supports your liver in its important metabolic functions. * The Zendocrine essential oil blend is made up of Rosemary, Tangerine, Geranium, Juniper Berry, and Cilantro. Tip: You can make this yourself with an empty Veggie cap and two drops of ZendocrineÂ® essential oil.